My wedding – 12 years ago – was one of the most memorable days of my life. I still vividly recall the overwhelming feelings of elation like it was yesterday. The excitement from a wedding can propel most newly-weds into marital bliss for the ensuing few months, at least. However, once the honeymoon period is over and the realities of life set in, those once intense feelings of bliss may fizzle out. We had our first child a year after we got married and as a result, our marriage relationship underwent a sea-change. From dreamy newly-weds, we morphed into sleep-deprived, barely functioning parents. Even though we had discussed parenting goals before marriage, actually becoming parents was a totally different ballgame. We found ourselves having to talk through and resolve multiple points of conflicts in our relationship. Our 12 years as husband and wife has brought about an awareness of the conflicts that we easily, and sometimes, unwittingly trigger as we walk through this journey of life together. I would like to believe that we have learnt (and are still learning) to navigate our differences, appreciate the complexities of each other’s personalities and create a loving home life that looks beyond being just functional. Our 12 years as husband and wife has brought about an awareness of the conflicts that we easily, and sometimes unwittingly trigger. A conflict trigger that appeared fairly early into our marriage – even before the children arrived – involved how chores around the house would be divided and the expectations we both had. From the onset, my husband and I agreed that I would do the cooking and he would do the washing up but we didn’t consider that we would have different points of view with regards to even the most basic of these chores. When it comes to dishes, I like to do them right away. My husband, on the other hand, likes to do them later. In the beginning, every time I walked past a sink full of dirty dishes, I cringed but would keep silent because I wanted to appear as the gracious, understanding wife. I soon realised that not addressing the issue only caused my resentment to grow. Thankfully, we’ve discovered that our conflict about household chores was easily resolved by honestly sharing our expectations of each other. My husband was unaware of my irritation over a sink of dirty dishes and I realised that he was not intentionally leaving those dishes unwashed. I made it a point to trust that he was putting in his best effort to get the chores done while he made it a point to get his portion done as soon as he remembered them. My husband and I grew up in very different family environments. He came from a Chinese-Eurasian family and spent his formative years overseas, while I grew up in a strict Chinese-Peranakan family. These differences came into play especially after we had children. We have disagreed on multiple occasions, ranging from disciplinary strategies and childcare arrangements, to even nutrition! Over the years, we’ve learnt that resolving conflicts over parenting is best done without the children present. This is not always easy especially when you are in the heat of the moment and want to work out an issue then and there. Whenever possible, we try our best to hold off resolving our conflict until the children are out of earshot. 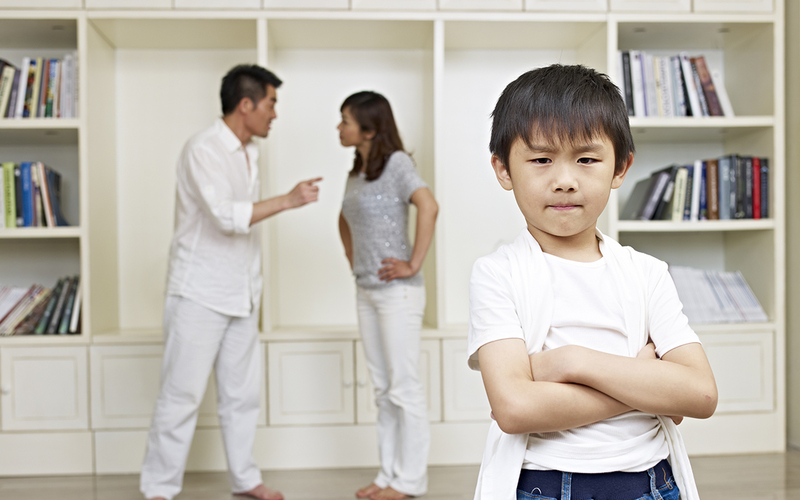 Resolving conflicts over parenting is best done without the children present. When it comes to finances, my husband and I are still a work-in-progress. In the last few years, however, we have learnt that discussions over finance work best for us when we deliberately schedule an appointment with each other. We usually do this after the children have gone to bed. Setting aside a specific time to discuss decisions and issues concerning money helps us stick to the plan and reduces the temptation of talking about more light-hearted matters. It allows us to share our expectations, concerns and values openly with each other. We have also used this time to discuss important life decisions (for example, career choices) together. Although these are the top three stickiest issues for us, and perhaps for many couples out there, at the end of the day, we need to understand that marriage is a journey of a lifetime. Every year together brings new and exciting discoveries about our spouse. We can use these as opportunities to appreciate each other better. When we begin to see each other as a tag-team and work towards resolving conflict as honestly and lovingly as we can, our marriage relationship is strengthened and we find ourselves in a better position to create a safe, secure and loving home environment for our children to grow up in. Life is a journey, and we want to walk with you. In need of a listening ear? Come speak to our qualified counsellors today.